SCVHistory.com LW3150 | William S. Hart | Triangle Distributing Corp. Invoice, 1917: Block Booking? 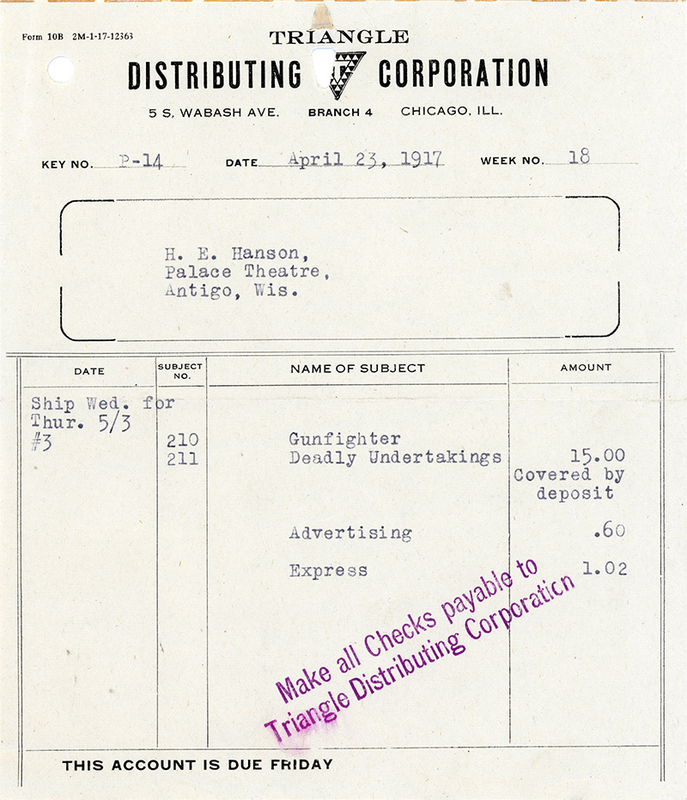 Invoice dated April 23, 1917, from Triangle Distributing Corp. to the Palace Theatre of Antigo, Wis., for showing the 1917 Thomas Ince production of the full-length (50 min.) William S. Hart feature, "The Gun Fighter" (shown as "Gunfighter"), and the 1-reel (10 min.) Mack Sennett short, "His Deadly Undertaking" (as "Deadly Undertakings"), also from 1917, featuring Harry Gribbon and Harry McCoy. This might be an example of block booking, if the independent movie house was forced to pay for something it didn't order and didn't necessarily want (the Mack Sennett short) in order to get something it wanted (the Hart film). "Covered by deposit" suggests the theater paid in advance for X-number of full-length features; then it's automatically debited for whatever "extras" the distributor decides to send along. See below. Triangle Film Corp. was started July 19, 1915, by three of Hollywood's most successful producers and directors: Thomas Ince, who launched William S. Hart's film career and created the assembly-line approach to film production; director D.W. Griffith ("Birth of a Nation"); and Mack Sennett (Keystone Studios, Pathé Exchange). Triangle was one of the first vertically integrated film companies, handling production, distribution (through Triangle Distributing Corp.) and theater operations. In addition to Hart, Triangle signed some of the biggest stars of the day including Mary Pickford, Douglas Fairbanks, Lillian Gish and Roscoe "Fatty" Arbuckle, and it produced the Keystone Cops comedies. The studio was located at 10202 W. Washington Blvd., on property Ince purchased from Harry Culver in Culver City. Ince named the company "Triangle" because the studio property looked like a triangle from the air. It didn't last long. Ince sold out to Griffith and Sennett in 1918, about the time Samuel Goldwyn bought the Triangle lot. Ince briefly teamed up with competitor Adolph Zukor to form Paramount-Artcraft Pictures and took Hart with him. Ince struck out on his own again (leaving Hart behind at Paramount) from 1919 until he (Ince) fell ill aboard investor William Randolph Hearst's yacht in 1925 and died. A production-distribution-screening system such as Triangle's would not be possible today. In 1921 the Federal Trade Commission began to crack down on "block booking," where production companies owned so many movie theaters that they were able to force independent theaters to pay for "blocks" of films, including lousy ones, sight-unseen, if they wanted to show the good ones. The FTC charged 12 film companies with "conspiracy and restraint of trade" in violation of anti-trust laws, and the battle waged for more than 20 years until finally in 1948 the U.S. Supreme Court demanded a separation of theater ownership from production and distribution. That's why film production companies can't own and operate movie theaters. LW3150: 9600 dpi jpeg from original invoice purchased 2017 by Leon Worden.